So, the "love month" is here. Do you have any plans for Valentine's day? Do you do anything special on that day with your other half? I will be honest, I don't really do Valentine's day. I like to surprise my hubby with little things on random days through the year, not "just" on Valentine's day. Therefore I don't really do any Valentine's day crafty projects. So when I saw that the theme of this month's challenge at The Sketchy Challenges blog is Love/Valentine's day I started thinking what to do. Lucky for me a very, very special person celebrate's her birthday this month. My sweet little girl who I LOVE with all my heart is turning three later this month. I can't believe how fast these 3 years have gone by. For this challenge I made a card for my birthday girl. Seriously, isn't this image just too cute? I really like it. A lot! I coloured the image with Faber Castell Polychromos and then carefully fuzzy cut it and raised it on foam pads to get some dimension. I decorated the card with all of my favourite embellishments - lace, pearls and lots of beautiful flowers from I am roses. 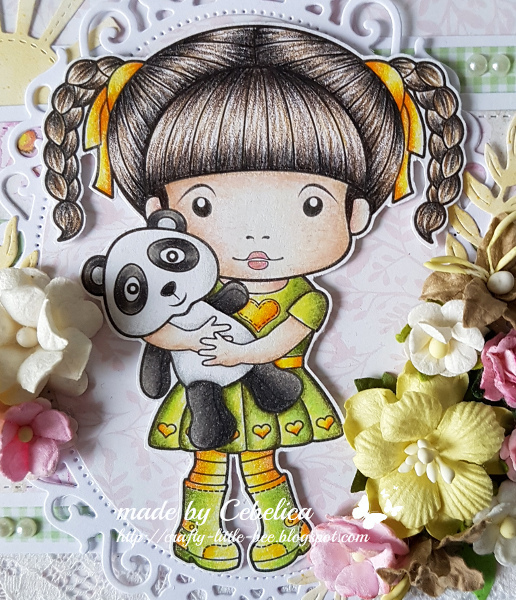 This is beautiful Maja, I'm sure your daughter will love it! It's so sweet! We have a tiny bit of snow compared to the rest of the country. This is such a beautiful card. 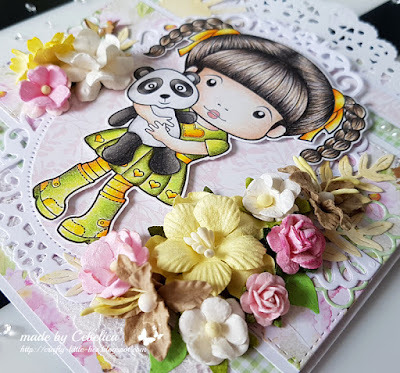 Love the cute image and fabulous layout. Thank you for playing along at Creative Inspirations, good luck and I hope you will join us again. Your card is so sweet! And I love the colors! Thank you so much for entering our ATG challenge at Through The Craft Room Door this week. Looking forward to see you again next challenge. Its so very beautiful card! Thank you soo much for taking part in our "anything goes with optional love/hearts” challenge over at Creatalicious & good luck in the draw. Lovely project, great colouring. 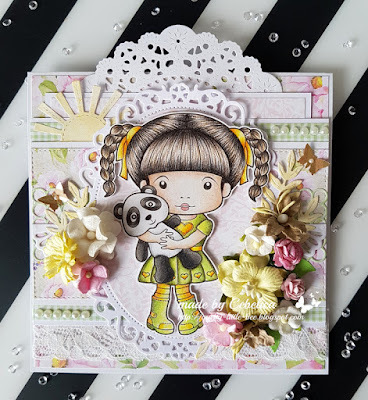 Thanks for sharing with us at Crafty Hazelnut's Patterned Paper Challenge. Hope to see you again.